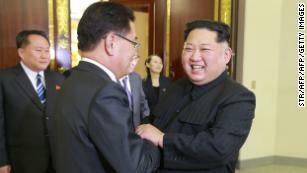 (CNN) President Donald Trump has agreed to meet with North Korean leader Kim Jong Un by May, the White House and the South Korean national security adviser said Thursday evening. “President Trump greatly appreciates the nice words of the South Korean delegation and President Moon. He will accept the invitation to meet with Kim Jong Un at a place and time to be determined. We look forward to the denuclearization of North Korea. In the meantime, all sanctions and maximum pressure must remain,” White House press secretary Sarah Sanders announced in a statement. The stunning announcement came after Kim extended an invitation to Trump to meet through South Korean officials, who met with Trump on Thursday. Trump would be the first sitting US president to meet with his North Korean counterpart, a stunning diplomatic breakthrough with uncertain consequences. The South Korean delegation first met with national security adviser Lt. Gen. H.R. McMaster and then Trump, who then delivered the news, a senior administration official official said. It all happened in about an hour. Kim told the South Koreans “he is committed to denuclearization” and pledged North Korea will “refrain from any further nuclear or missile tests,” the South Korean national security adviser Chung Eui-Yong said Thursday at the White House. Trump has expressed an openness to dialogue with North Korea, but the Trump administration has said North Korea must first take concrete steps toward denuclearization. 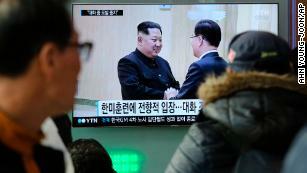 As of Thursday evening, there was no indication that North Korea had pledged to take those steps. Trump’s approach to North Korea has wavered between bellicose rhetoric and expressions of openness to diplomacy — with the President saying the US would rain “fire and fury” on North Korea one day and then saying he would consider speaking directly with the country’s leader under the right circumstances.